Support for AutoGlow presented by Ford Motor Company continues to grow and this year netted nearly $250,000 for The Children’s Center. Nearly 1,000 guests enjoyed the gala at Ford Field in Detroit following the NAIAS Charity Preview. 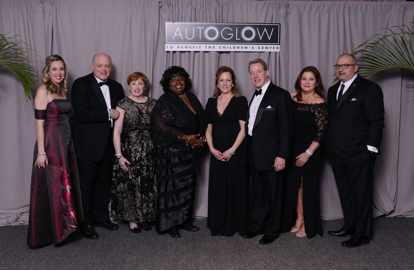 AutoGlow was hosted by Lisa and Bill Ford and Kathy and Jim Hackett of Ford Motor Company. The Ford family has continually supported The Children’s Center since it was founded in 1929. Ford Motor Company has served as Presenting Sponsor of AutoGlow since its inception. Enthusiasm for the event was evident in both ticket sales and corporate support which included several sponsors increasing their sponsorship level. They include Piston Group and Gonzalez Production Systems. Several new companies joined Ford Motor Company as AutoGlow sponsors this year. These include V-to-X, LLC and the Michigan Regional Council of Carpenters. AutoGlow’s theme was “An Evening in Casablanca” paying tribute to the film’s 75th anniversary and echoing the 85th anniversary of The Children’s Center just two years ago. A 1941 Ford Super Deluxe convertible delighted guests as it was parked in front of a large screen showing the beloved film. Levy Restaurants incorporated the theme into the strolling supper with menu selections featuring the flavors of Morocco such as Chicken Tangine and the Marrakesh bazaar market table featuring fresh and dried fruits and vegetables, olives and breads, a Moroccan bocadillo sandwich and Turkish coffee. Guests donned beaded slippers and danced the night away to the high-energy band Nightline. Thanks to the generosity of Delta Air Lines, 10 guests took home round trip first class tickets anywhere in the U.S., including Alaska and Hawaii and travel vouchers worth $2,000. Echoing the accolades and media awards at the 2018 North American International Auto Show were several new vehicles on display from Ford Motor Company and Lincoln Motor Company. Included were the 2018 Lincoln Navigator, 2018 Lincoln Continental, 2018 Ford F-150, and 2018 Ford Expedition. V-to-X, LLC, Gonzalez Production Systems, Michigan Regional Council of Carpenters and Marketing Associates.